D DOLITY 2x Creative Animal Ornament Water Floating Kissing Frog on Lotus Leaf Figurine Resin Green Plants Kid Toys Fountain Decoration Garden Decor | Fountain City Art Ctr. 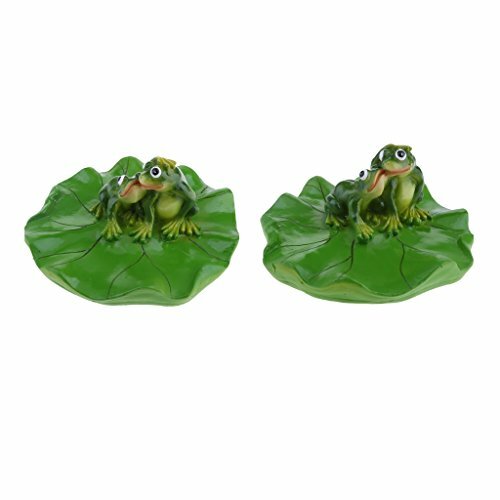 - Water floating lotus leaf frog ornament, extremely realistic and highly detailed garden decoration, summer landscape. - Cute resin animal statue, perfect for garden pond, swimming pool, fishpond, fountain, bathtub, and other water floating decoration. - Also a deadly decoy for hunting or fishing. Also a deadly decoy for hunting or fishing. Water floating lotus leaf frog ornament, extremely realistic and highly detailed garden decoration, summer landscape. Cute resin animal statue, perfect for garden pond, swimming pool, fishpond, fountain, bathtub, and other water floating decoration.